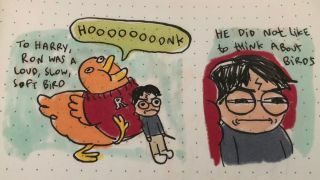 Bizarre lines from the Harry Potter pastiche get brought to life with funny doodles. The Harry Potter book series has spawned some amazing spinoffs over the years. And while the likes of the new Fantastic Beasts and Where to Find Them films and stage play The Cursed Child are a legitimate expansion of the series, a pastiche chapter written by a bot has tickled the internet's funny bones this week thanks to its peculiar turns of phrase that ape the style of the wizarding world's author, JK Rowling. Created by Botnik Studios, the short new chapter has been written with a predictive text keyboard that conjures up new sentences using an algorithm. The result is the bizarre but brilliant passage titled: Harry Potter and the Portrait of What Looked Like a Large Pile of Ash. We urge you to take two minutes out of your day and read it - it beats fan fiction like My Immortal at any rate. As if the title wasn't unusual enough - although it does feel strangely true to Rowling's writing style - the contents of the story itself are where things start to get really weird. Kicking off with the fantastically odd sentence "the castle grounds snarled with a wave of magically magnified wind", the text only gets more absurd as it goes along. Writing this ludicrous are just begging for some artistic interpretation, and thankfully comic artist Megan Nicole Dong has stepped up to the challenge. Her distinctive doodle style lends itself perfectly to the short story's zany passages, such as Ron showing off his bad shirt or Harry Potter throwing his freshly torn-out eyes into the forest. Check out a selection of Dong's fantastic doodles below, and be sure to head over to her Twitter page where she's posting more illustrations based on the story. With pretty much every sentence giving us the giggles, we can't wait to see which part she draws next. Which is worse, Ron or his Ron shirt?